Salads usually involve something green. But when I came across this salad recipe, I was drawn by the fact that there wasn't any greens involved - unless you want to count the parsley called for in the recipe. 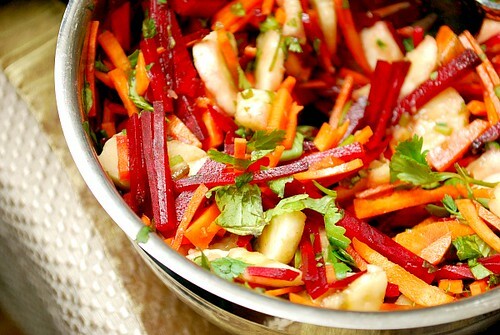 This salad is one that is beautifully presented with the bold colors from the beets and carrots. I didn't have time to cut the apples into matchsticks so I kept them in bite sized chunks instead. I especially love the citrus notes from the orange and lime. Who knew healthy eating could be so delicious and colorful too?! In the same bowl, layer beets, carrots, apple, and parsley. Season with additional salt and pepper to taste. Toss salad right before serving. *To cut matchsticks, use a mandolin or a food processor that has either a julienne blade or large shredding blade. This is such a beautiful salad that I don't think you'd even miss "bad for you" foods when eating it! Now, when you say turnip...do you mean parsley? Can this be made ahead? I'm thinking maybe 18 hours before serving?